Something big is happening this weekend. No, it’s not the start of X factor, it’s bigger than that. This weekend, September 22nd 2013 is the autumn equinox in the northern hemisphere and the spring equinox in the southern hemisphere. Few times in life we pause and think of what is happening to the earth as it spins its’ way through the solar system. This weekend share an understanding with those around you of what happens on this date and the significance to us all. but what is an equinox? and how does it affect us and what we see?. 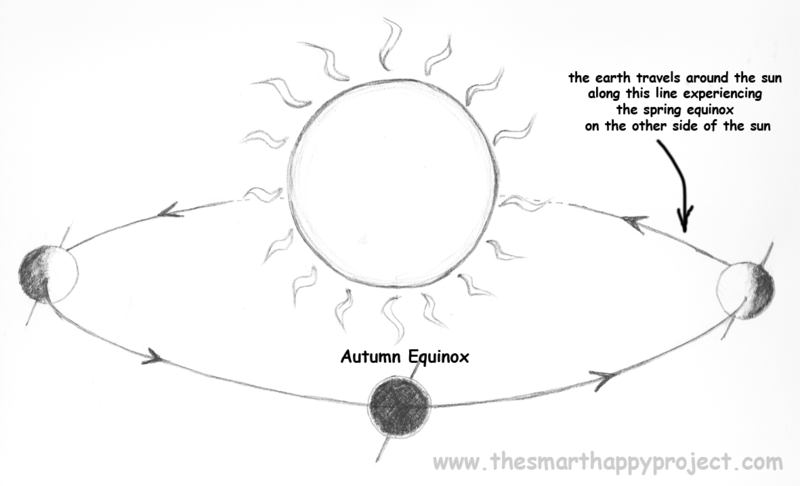 Equinox means ‘Equal night’ in Latin. Everywhere on the planet, during the 24 hours of the equinox, will have equal amounts of daylight and darkness. We’ll all have the same, almost 12 hours of dark and 12 hours of light. Ok, if you want to be pedantic, the construct of time zones does alter it, and it gets light before the sun is fully up doesn’t it? but in terms of geometry the centre point of the sun will be above the horizon for 12 hours. Everyone on the planet experiences the same. Regardless of religion, race, wealth or location we all share in this simple experience. For us in the northern hemisphere from the autumn equinox onward the darkness will be more hours in the day than the daylight. When the northern hemisphere has the autumn equinox, at the same time the southern hemisphere is experiencing the spring (or vernal) equinox and so begins their lengthening of daylight hours for the southern hemisphere. 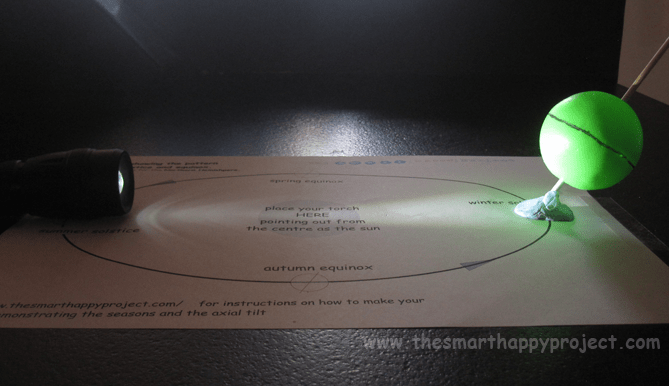 If you are explaining to a youngster or you are a youngster you might like to make the easy model below, with instructions to demonstrate the seasonal rotation and how we get the autumn equinox. What is important to remember here is the fact that the earth’s axis (the line between the north and south pole around which the earth spins everyday) is tilted in respect to its relationship with the sun. That means that the north pole doesn’t point the same north as the sun, it points at an angle. The earth leans. Like the leaning tower of Pisa or the slippy bit on a slide. The earth does not sit upright. This is important to grasp. It is called the axial tilt. It is because of this tilt that the earth experiences seasons. 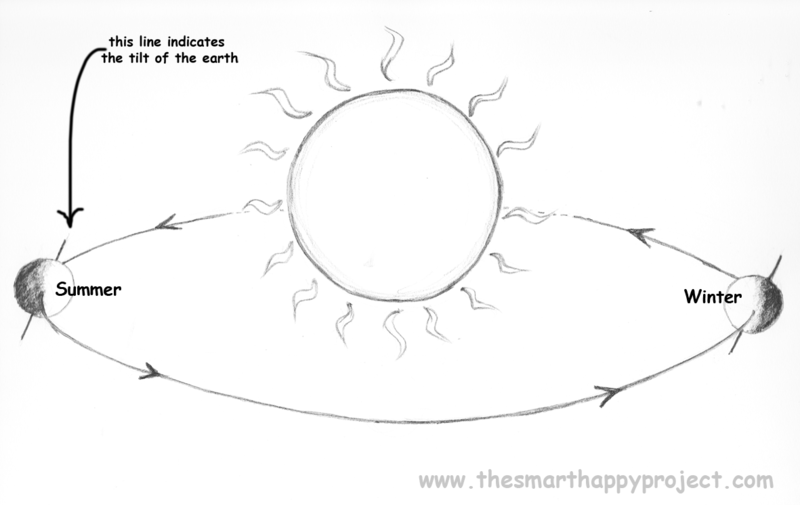 The earth rotates around the sun resulting in sometimes that tilt pointing toward the sun and sometimes away from the sun. This is then summer and winter in the northern hemisphere, the opposite is true if you live in the southern hemisphere. 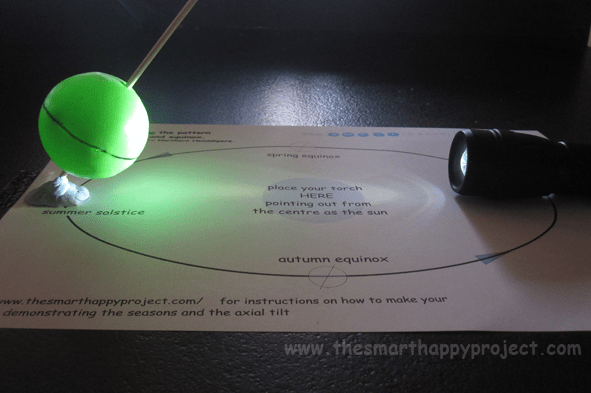 Now build your own easy model of the earth’s seasonal rotation around the sun. For those in the southern hemisphere, swap the word ‘summer’ for ‘winter’ and swap ‘autumn’ for ‘spring’. a plastic hollow ball, like a ping-pong ball or plastic play ball. step 1: sellotape your print out to the table. 3: Mark a line around the centre of the plastic ball to demonstrate the equator around the centre of the earth. 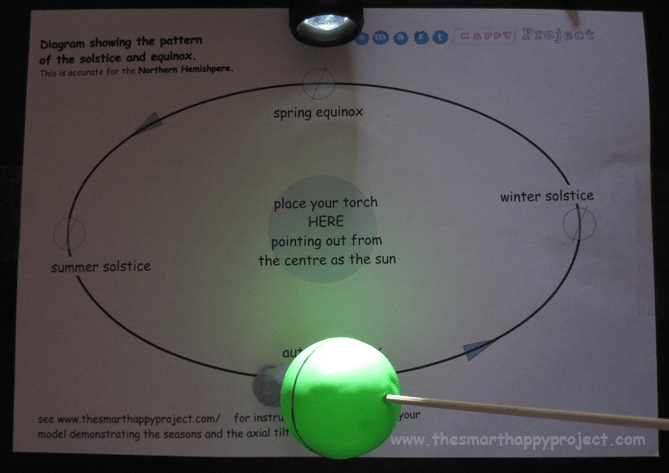 4: Use the lump of blue tack and fix the end of the skewer with the ball nearest it to the position of the summer solstice in the diagram. 6: switch on your torch (the sun) It might have to be dark for this bit, (yeah, get to stay up late!) place it in the centre as indicated – or near the centre depending on your torch beam – pointing directly at the leaning model of the earth. See how the light is cast mostly over the northern hemisphere and a little below the equator line? this is the height of summer season in the northern hemisphere. see model above. 7: now lift the blue tack and position your earth on the opposite side, taking care not to move the leaning position. Keep it leaning the same way and place on the winter solstice mark. Also spin your sun around to point at it. The sun is now shining on the southern hemisphere. see model below. ok, to recap .. we understand how we get summer and winter seasons, the extreme point of each are called the solstice, when the earth’s journey is at its furthest point leaning away or toward the sun. 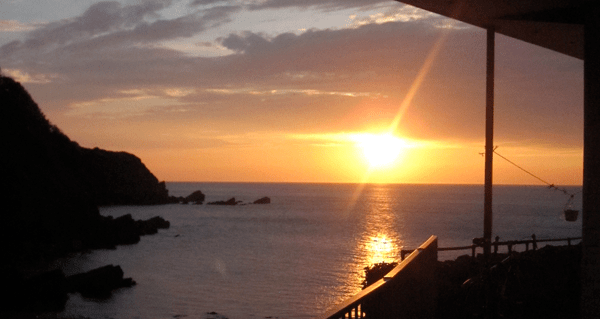 So what is an equinox? lets look again at that illustration. 1: place your leaning earth at the point marked ‘autumn equinox’ making sure to keep it leaning in the same direction, don’t turn it. 2: shine your torch towards it from the centre. 3: see how the entire side of the earth is lit up by the sun. The lean of the earth is neither towards or away from the sun but alongside it and so as the world turns on its axis over 24 hours in this position, no-one on earth is closer to the sun than anyone else and hence everyone experiences daylight equally. you can do the same for the spring equinox too. You know what to do now. So few times in life we look outward. The rush of daily life is so much, getting them to school, paying the bills, making that appointment, that it keeps our focus inward, like a centrifugal force that keeps us spinning. As this weekend comes, pause and look outward. Spend a minute and share this understanding with those around you. Look outward to the sun and know that for one day you will experience the sun’s presence the same as everyone else on the planet. Then bid it well on its journey into the southern hemisphere. For thousands of years civilisations have paid homage to this simple and enduring fact. Ancient people ritualised this occurrence and celebrated it with joy. Monuments and buildings for centuries have been built around the seasons and their journey. Sometimes it as been the only sure and fixed mark. This is a National Geographic video that explains the equinox in terms of the sun’s ecliptic journey (have to say, I found it more complex to understand as it’s explained from an astronomers viewpoint) but there are interesting facts about how the autumn equinox is marked in different cultures. So however you mark this passing point, maybe lighting a candle or a special meal shared together, as hundreds of civilisations have done before you, enjoy your equinox!. If you liked this post and found it useful, please share the post to friends. Use the ‘Facebook’ or ‘Tell a friend’ buttons below, Thank you. The text and images that make up the contents of this website are the property of the Smart Happy Project unless otherwise credited. Please use internet etiquette.